Start your holiday celebrations with a trip on the Amtrak Pacific Surfliner. Sink into your seat and enjoy the diverse scenery of Southern California while traveling to top destinations, including San Diego, Orange County, Los Angeles, Ventura, Santa Barbara, San Luis Obispo, and more. Onboard amenities such as a Café Car, Wi-Fi, power outlets and spacious seating offer a comfortable ride that will have you arriving refreshed and ready for holiday celebrations. Thanksgiving week is a busy time onboard all Pacific Surfliner trains as travelers make their way to family and friends throughout Southern California, so reservations are required from Wednesday, November 21 through Sunday, November 25, 2018. Additionally, the Rail 2 Rail program will be suspended from Wednesday, November 21 through Monday, November 26, 2018 (resuming on Tuesday, November 27, 2018). During this time, Metrolink and COASTER passes will not be accepted. Amtrak monthly and 10-ride passes may be used. 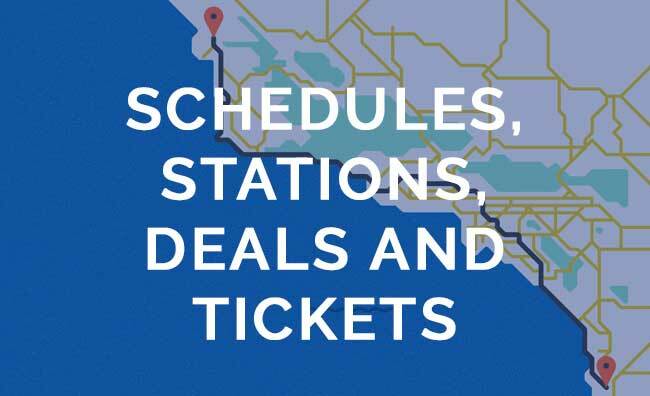 Book your tickets beforehand – visit PacificSurfliner.com, call 1-800-USA-Rail, or use the Amtrak app. Take up to two bags (each weighing 50 pounds or less) for free. We have space on the first level of the train for larger and heavier luggage, and there is also room above each seat. If you are traveling between stations with luggage service, you can check your bags. Stations are marked on the schedule with a suitcase icon. Arrive early, especially on holiday weekends since the train stations might be busier than usual. Consider upgrading to Business Class for a little extra legroom, free snacks and drinks, and other perks. Bring valid photo identification with you, as the conductor could request it. Traveling by train is fun – spend time with loved ones, enjoy the beautiful scenery, and experience the nostalgia of rail first-hand. You might enjoy it so much that it will become one of your new Thanksgiving traditions.